Kvatch Soldier is a common Willpower creature card. It is part of the Core Set. In addition to the card's availability in the Core Set, two copies are included in the Band of Survivors deck, two copies in the Tribunal Glory theme deck, and one copy in the Imperial Might deck. The card is named for the Cyrodiil city of Kvatch. The card was originally named "Skingrad Soldier" and was renamed to "Kvatch Soldier" prior to open beta. 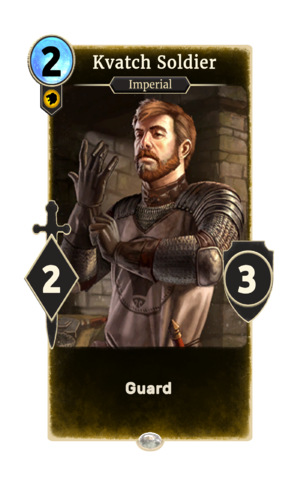 In fall 2016, during the Open Beta period, the card's art was swapped with that of Colovian Trooper, ostensibly to add the emblem of Kvatch to its art. A Kvatch Soldier first appeared in Oblivion. This page was last modified on 15 February 2019, at 12:06.